Chad Chesmark is a best-selling author whose dynamic, motivational presentations bring energy and excitement to corporate events for companies like GE and Disney. 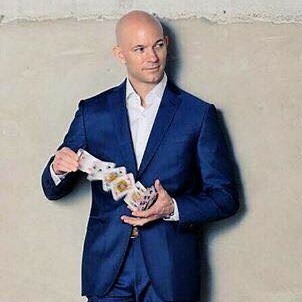 Chad uses a consummate blend of international award-winning sleight-of-hand magic, mind-reading, suggestion, humor and his experience as a 17 year headlining entertainer for the top 5 major cruise lines, to bring your company a memorable, and magical, experience. During his stage presentation, your guests will laugh out loud while Chad exhibits the true power-of-the-mind with hilarious demonstrations in magic, suggestion, psychology, misdirection, and showmanship, all themed around the topic of LEADERSHIP. This clean comedy show has an abundance of audience interaction, that will motivate your audience to step out of their comfort zones, and become a part of the show. Chad also offers a stage comedy hypnosis show that will turn your audience into the stars of the show and have the audience laughing non-stop. Chad’s award-winning, world-class walk-around, or strolling magic, is an excellent way to amplify your event’s social or cocktail hour. Here Chad will circulate amongst your guests from table to table, or from group to group while entertaining with humorous, mind-blowing magic. Chad’s presence at your event will put the “social” into your social hour and encourage attendees to network, mingle and enjoy themselves. (Strolling Magic can be used on its own or in combination with a stage presentation). If you're looking to boost your trade show ROI, Chad's live, interactive, trade show marketing program is the way to go. Chad is an expert at using his mind reading & magic skills to turn aisle walkers into potential customers for your booth. He will attract large crowds to your exhibit throughout the show, share your company's message in an enthusiastic and entertaining way, and then pass on the pre-qualified leads onto your sales team. Find out more about Chad Chesmark Speaker/Mentalist/Hypnosis at http://leadershipmindpower.com/.